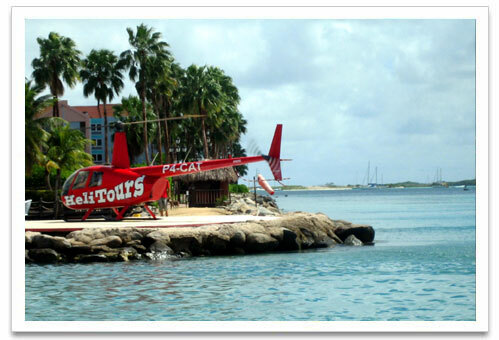 Enjoy a smooth, safe, memorable helicopter tour of Aruba! The Aruba Heli-Tours are based at the Seaport Helipad in downtown Oranjestad and is the only (privately owned) helicopter company on Aruba which provides scenic flights over the island. The helicopters fly with 2 or 3 passengers on a first come, first served basis unless a reservation is made in advance. All tours fly with a minimum of 2 passengers. Aruba Heli Tours will fly you in a Robinson R44 Helicopter piloted by highly trained and experienced professionals. Their number one priority and focus is on safety. They have a 100% safety record. The helicopter is not only safe but comfortable with leather seats and is air conditioned. Headphones are used on board the helicopter so that passengers and pilot can communicate with each other easily during the flight. The pilot knows the history of Aruba and will point out all the sites and landmarks on the island for great photo opportunities. You might even get some great dining tips! Check out the tours that are offered...Eagle Tour, Beach Tour, and Island Tour. 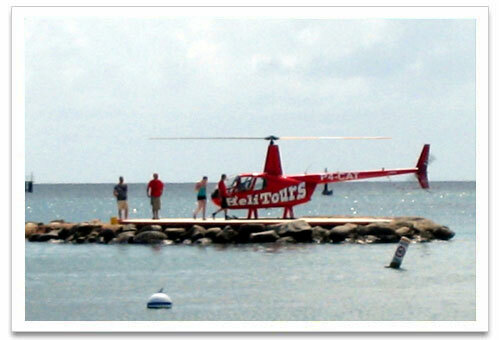 Aruba Heli Tours offer Gift Certificates for that special occasion, birthday, anniversary, etc. Please check with Aruba Heli Tours in case of tour or price changes. After enjoying a breathtaking scenic tour of the island, what will you do next?